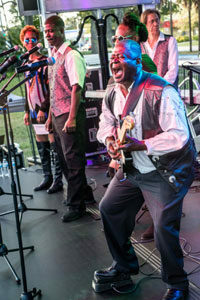 MIAMI – December 3, 2018) – The African Heritage Cultural Arts Center (AHCAC) presented its second annual Art Blues Soul & BBQ Festival on Saturday, Dec. 1, 2018, 1 to 6 p.m. on the grounds of the AHCAC, 6161 N.W. 22 Avenue, Miami, at the intersection of Dr. Martin Luther King Jr., Boulevard and Moonlight Way. More than 725 attendees from Miami to Switzerland participated in the Festival throughout the day. 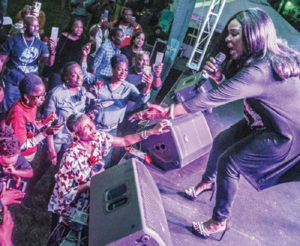 Celebrating the arts, sounds and flavors of Black Miami during Art Basel week, the Festival featured a fantastic blues and soul music concert presented on an outdoor stage with a spectacularly lit LED background. 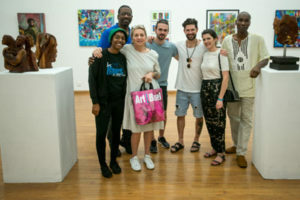 The stunning visual art creations exhibited inside the Center’s Amadlozi Gallery fascinated the steady flow of visitors, and mouth-watering BBQ, Caribbean and soul foods permeated the air with irresistible aromas rendering attendees powerless to repeated visits to the food court. The voice of the legendary R&B artist Angela Winbush thrilled the audience right out of their seats with her performance of the hits “Your Smile,” “You Don’t Have to Cry,” and “I’ll Be Good.” Mojo Ike & Val Woods delivered the blues in their authentic, captivating gut-wrenching sounds while A. Randolph & The Smash Room Project awed the crowd with their unique contemporary music stylings and choreography. The Harden Project and AHCAC Entourage Apprenticeship MVPs Wesley Wray and Chelsea Royal were also extraordinary audience pleasers. Emcees, “BET Comic View comedian” “Chello” Davis and “DJ Chico the Leo,” emerged into a dynamic duo that brought laughter, smiles and motivated spontaneous line dances throughout the day. Art Basel’s Marina Mottin, Regional Head of VIP Relations Europe and Annina Brunner, VIP Manager Switzerland were among the notable visitors of the Amadlozi Gallery. There, festival goers were inspired by watching various artists sketching and painting live in the Voyage to Another World exhibition which will host the unique and brilliant visual art until the end of the year. The exhibition features pieces created by the distinguished talents of Addonis Parker, Robert McKnight, Ray Parris, Darryn Ferguson, Nana K. Blackman, Donald McKnight, Lucius King, Re-edeema Reborn, Karla Cohen and Carla Jamieson. 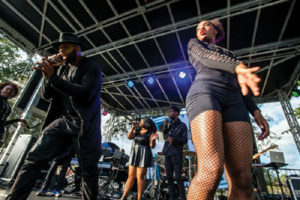 Other renowned guests of the Art Blues Soul & BBQ Festival included Rodney Baltimore from HOT 105 and Ruban Roberts, President of the Miami-Dade NAACP. A premier arts training institution in Liberty City, the African Heritage Cultural Arts Center is nationally-recognized for developing hundreds of outstanding artists in all arts disciplines over the last thirty-four years. Known as the artistic home of alumnus Tarell Alvin McCraney, co-creator of the award-winning movie “Moonlight”, the Center’s other distinguished alumni include Robert Battle, Artistic Director of the Alvin Ailey American Dance Theater; Keenan D. Washington and Fergie L. Philippe, US Tour cast members of Hamilton the musical; Bianca Brewton, professional dancer (Beyoncé and Bruno Mars); Shareef Clayton, Gram-my-nominated jazz trumpeter (Arturo Sandoval and Stevie Wonder); and tap dancer Marshall Davis, Jr., associate choreographer of the Tony-nominated play, Shuffle Along.